With Canvas People, you can get a FREE 8×10 Photo Canvas or $50 off a larger canvas. These are awesome canvases and make for great gifts for weddings, graduations, and much more. It’s really easy to do. 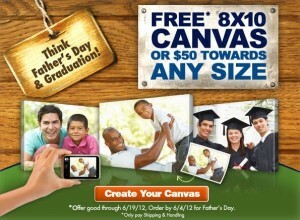 Upload your photos to Canvas People, choose your size, and have it shipped! The shipping on this size canvas is $14.95, so that’s not too bad for a $49.99 canvas. This sale ends on 6/19. Check out more Photo Deals!